Wader Quest: As if waders didn't have enough to deal with; without Avian Botulism! 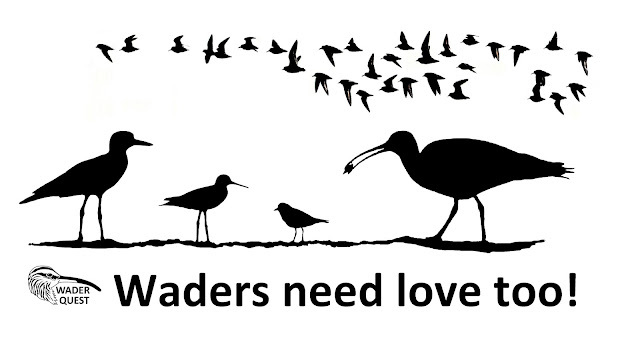 As if waders didn't have enough to deal with; without Avian Botulism! 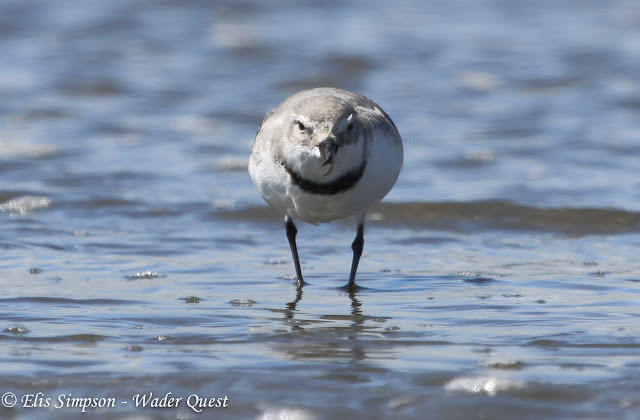 Every year many thousands of birds die of Avian Botulism around the world and it may be affecting waders currently in some parts of the world. Recently we heard a report that residents, and the Chief, of Pantai Sungai Cemara Village, Jambi, Indonesia reported that there are many waders paralysed on the beach, several Great Knots were found floundering on the sand. This may have been caused by Avian Botulism although some reports suggest the birds were merely exhausted. The same, or similar, was happening in Paracas in Peru where Semipalmated and Western Sandpipers appeared to be affected. Some of the birds were very debilitated but alert, seemingly without the energy to stand. 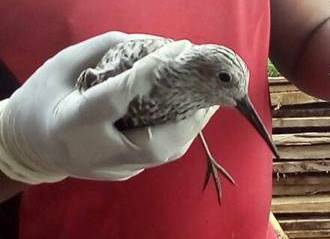 Whether or not these birds were infected by botulism remains to be seen but this time last year there was a botulism outbreak in New Zealand which affected the Pukorokoro Miranda Shorebird Centre when many threatened birds were killed. Avian botulism is a disease that causes paralysis and is caused by ingestion of a toxin that is produced by the bacterium Clostridium botulinum which is widespread in soil. The illness is caused by the toxin not by the bacterium itself. These outbreaks are associated with unusually warm temperatures (average over 21°c) with de-oxygenated water and a source of protein (often decaying invertebrates or vegetation). They are often associated with drought conditions and it is feared that these outbreaks will be exacerbated by climate change and become more common than they are now. The good news is that infected birds in care can be saved using antitoxins and birds in the wild, which are mildly affected, can recover by themselves if they have access to clean water, reasonable weather and of course don't get eaten by a predator. A bird that lives for 48 hours or more has a high chance of survival but captive birds should not be released immediately upon recovery as the toxins can occur in their faeces for several days after . An outbreak will clear naturally once the weather cools especially if there is heavy rainfall although this conditions are likely to lower survival chances of infected birds. Great Knot in care: Photo Iwan Londo. One study has suggested that, in the case of waders, feeding habits may influence a species’ susceptibility to botulism. The toxins remain near the surface of the muddy substrate and therefore those species that feed at or near the surface are more prone to ingesting the toxin than others which probe deeply in the sediment. 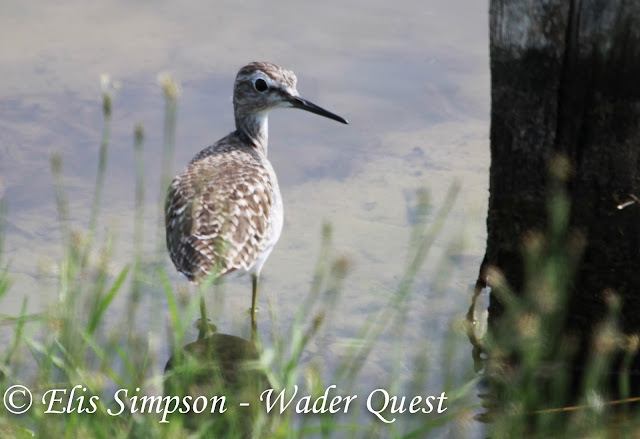 In a survey in Saskatchewan they found that shorter billed waders such as the small Calidris waders were most at risk as well as yellowlegs and American Avocets that scoop their food from the surface of the substrate whereas the more common and deep probing dowitchers were less affected. 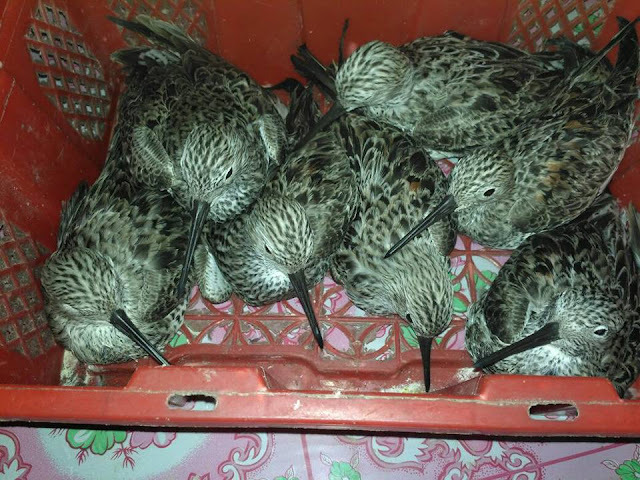 A further study in Europe compared Common Snipe and Wood Sandpiper and found that survival rates were higher in the snipes that probe deeply in the substrate than in the sandpipers that pick their food mainly from the surface or just under it. It seems there is little that can be done to prevent Avian Botulism, it is widespread and endemic in the soil that birds feed in, and on. Birds do not build an immunity to the toxins and can be re-infected and there is no evidence that vaccines work except perhaps over a very short period. Affected birds can be recognised as paralysis sets in. They are unable to use their legs and wings and cannot control their third eyelid. This loss of muscle function means that they have difficulty holding their heads up due to weakened neck muscles. In ducks and birds in water this can result in drowning. Dehydration, electrolyte (salt, calcium etc) imbalance, respiratory failure and predation are the main causes of death when a bird is affected. Danger lurks behind every corner for waders, this horrible illness, which can inflict a slow and painful death on the birds unlucky enough to contract it, is just one of a multitude of pressures on our dwindling wader populations. Thanks for this. Very interesting.